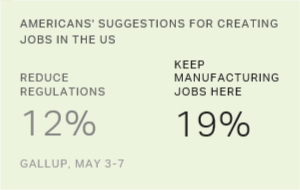 WASHINGTON, D.C. -- The Gallup Good Jobs (GGJ) rate, the percentage of U.S. adults employed full time for an employer, rose nearly one percentage point to 45.4% in May. The GGJ rate is at its highest point so far this year, and matches where it was at this time in 2016. These data come from Gallup Daily tracking interviews with 30,400 U.S. adults, conducted May 1-31. The GGJ rate typically increases between April and May. 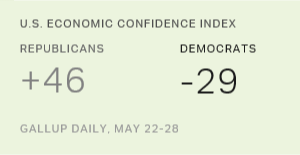 It has risen, albeit slightly, seven out of eight times during this period since Gallup began tracking the measure in 2010. The rate of increase has ranged from 0.4 to 1.1 percentage points, with the current increase of 0.7 roughly equaling the average. The current GGJ rate is above the measure's average of 44.3% since 2010 and well above the all-time low of 41.7%, recorded in February 2011 as the U.S. economy struggled to recover from the Great Recession. However, it is still below the high point of 47.1% recorded in July 2016. The GGJ rate is the percentage of U.S. adults, aged 18 or older, engaged in full-time employment -- at least 30 hours a week -- by an employer. Individuals who are self-employed, working less than 30 hours a week, unemployed or out of the workforce are not counted as being full-time employed. The GGJ metric measures only full-time employment status with an employer, not job satisfaction or compensation. The GGJ rate is not seasonally adjusted. U.S. workforce participation was stable in May at 68.0%, not meaningfully different from the 67.6% in April. The current rate is technically the highest so far this year, and is up slightly from 67.3% in May 2016. Gallup's workforce participation rate measures the percentage of U.S. adults aged 18 or older who work full or part time, or who are currently not employed but actively seeking work. 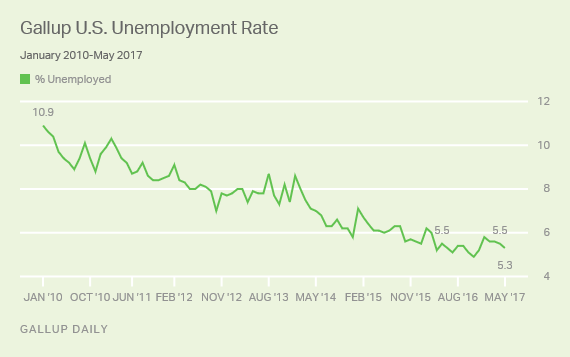 Gallup's measure of the U.S. unemployment rate remained essentially unchanged at 5.3% in May, compared with 5.5% in April. The current unemployment rate is also nearly the same as the 5.5% recorded at this time last year and well below the high of 10.9% in January 2010. The current rate is slightly above the low of 4.9% measured in November 2016. Unlike the GGJ rate, which is based on the total U.S. population, Gallup's measure of unemployment is a percentage of the labor force, defined as those working or seeking work. This is similar to the government's Bureau of Labor Statistics unemployment rate, which will be released Friday for May, although there are methodological differences between the two that are detailed at the end of this article. The trend in Gallup's measure is strongly correlated to the BLS' over time. However, the two measures do not always match on a monthly basis, partly because the BLS seasonally adjusts its most commonly used measure of unemployment, while Gallup does not. The underemployment rate for U.S. adults was essentially unchanged in May at 13.9%, compared with 14.0% in April. The current underemployment rate is also virtually the same as the 13.7% recorded at this time last year and remains well below the high point of 20.3% found in March 2010. 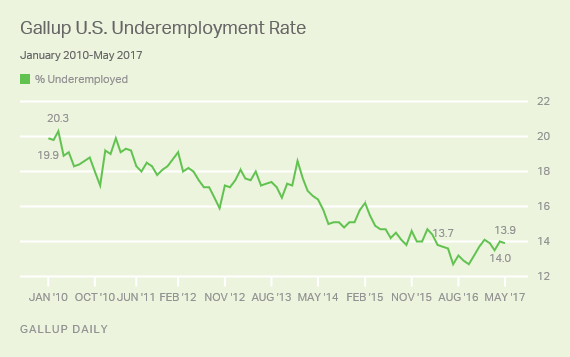 Gallup's measure of underemployment is a combination of U.S. adults in the workforce who are unemployed and those who are working part-time jobs but desire full-time work. 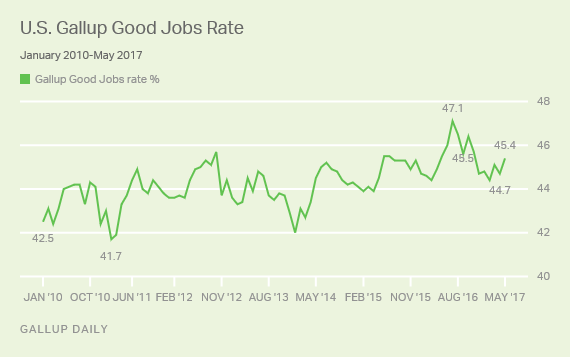 Gallup's employment measures present a somewhat positive picture of the U.S. economy in May. All four of Gallup's employment measures remained stable or improved from April. The workforce participation, unemployment and underemployment rates held steady, while the GGJ rate rose. The four measures remain at or near their best levels for 2017, though generally below their all-time best readings and well above their worst points, indicating a generally positive employment situation in May. Results for this Gallup poll are based on telephone interviews conducted May 1-31, 2017, on the Gallup U.S. Daily survey, with a random sample of 30,400 adults, aged 18 and older, living in all 50 U.S. states and the District of Columbia. For results based on the total sample of national adults, the margin of sampling error is ±.56 percentage points at the 95% confidence level. All reported margins of sampling error include computed design effects for weighting.